Boxing Day is quieter than Christmas but for us, it is also my father-in-law's birthday. Tonight, we'll all be gathering again for his 86th birthday barbecue. A quiet moment this afternoon sent me to my room to make him a card. Inspiration came from the sketch at Create with Connie and Mary, which I'd seen before Christmas and loved. So glad that the challenge was extended for the holiday season. I'm enjoying very much the new set Dragonfly Dreams with the coordinating dies, available soon on 4 January when the Occasions catalogue is released. 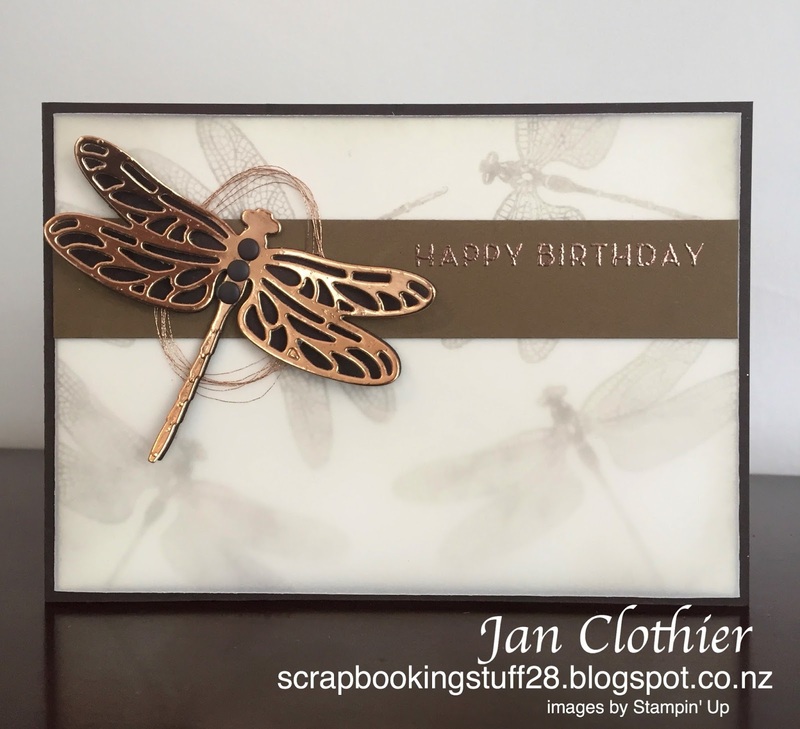 In this card, I stamped off the dragonflies in Crumb Cake then used them to create a background. It's covered with a vellum overlay because I liked the dreamy, floating effect it gave. The card base is Early Espresso and so is the under-dragonfly. The delicate wings are cut from copper foil. He's decorated with some carefully hoarded neutrals candy dots and backed with some copper filament threads. The sentiment is copper embossed onto Soft Suede and is from another about-to-be-released set, Big on Birthdays. 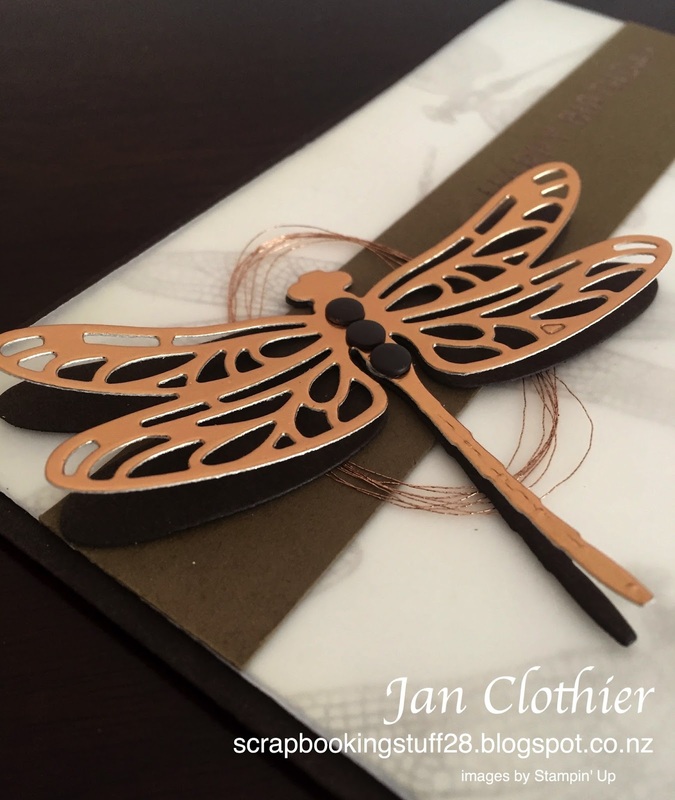 Other: Copper embossing powder, Detailed Dragonfly thinlits, copper filament thread, neutrals candy dots. Dreamy is right! The colors look amazing together and have a nice masculine feel. Happy 8th birthday to your FIL! Thanks for playing along with us at Create with Connie and Mary! I love it! Really stylish and elegant! Thank you for joining us at Create with Connie & Mary this week! Simply STUNNING!!! I absolutely LOVE dragonflies and LOVE these new framelits. I love how you kept it very simple...really shows them off! 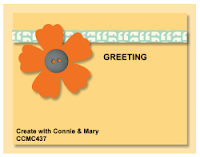 Thanks for playing along this time in the Create with Connie and Mary Thursday Challenge! WOW! This immediately caught my eye on Pinterest. Love your use of the vellum to create this look! Hi Weaser. I cut the vellum the same width as the card but about 1.5cm longer. Then I put a strip of tape along the short sides and folded the vellum over on each side. That tapes the vellum firmly but out of sight. 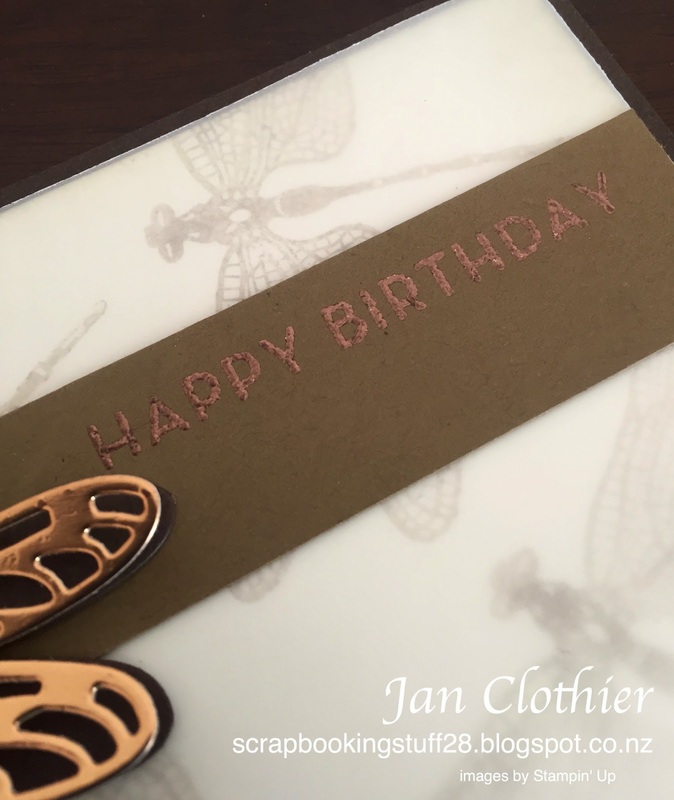 You do have to make sure you've made a good clean fold with a bone folder so that the vellum fits over the card base snugly and neatly. In addition, I put a line of tape down on the card base underneath the area that the sentiment strip would cover up. So it's got three good strong strips of tape but none anywhere that will show. Your card is gorgeous. I love the vellum because it makes it more elegant.